Bayer’s new herbicide Emerger (aclonifen) has been authorised for potatoes and gained EAMUs for carrots, parsnips, onions and a range of herbs. 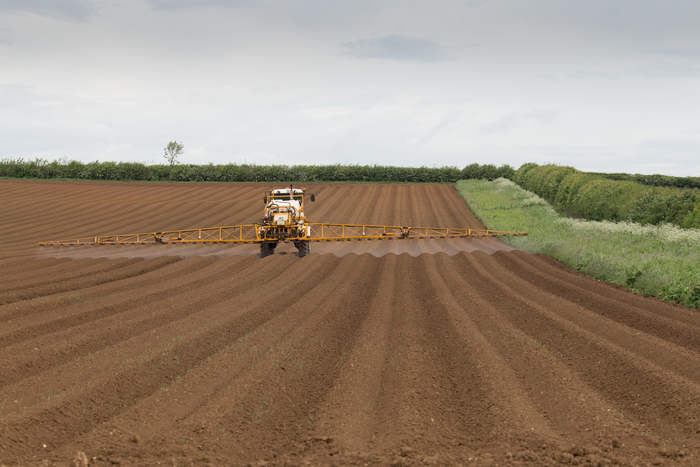 Containing 600 g/L aclonifen in a suspension concentrate (SC) Emerger is authorised for one pre-emergence application in potatoes at a maximum individual dose of 1.75 L/ha. Mr Hagues says it is a flexible product that can be used effectively in combination with other potato herbicides. “From European experiences the mix of 2 kg/ha Artist (flufenacet + metribuzin) with 1.75 L/ha Emerger will be a robust programme for pre-emergence weed control. Weed symptoms are bleaching and necrosis of young shoot tissue as it develops. The active substance is absorbed strongly onto soil particles and has very low water solubility making it very low risk to groundwater. Residual activity is usually two to three months. There are three EAMUs covering Emerger’s use in carrots, parsnips, root parsley, garlic, onion, shallot, caraway, dill and parsley which permit one pre-emergence treatment at a maximum individual dose of 1.75 L/ha. They were sought by the AHDB EAMU programme following good results in SCEPTREplus trials. In addition to the broad spectrum of control listed by his colleague in potatoes, Mr Lacey says carrot, parsnip and onion growers will benefit from its contribution to control of annual meadowgrass, knotgrass, charlock and cleavers and its activity on groundsel. Onion growers are advised to read the advisory information on the EAMU and to note that use of Emerger on onions grown from seeds requires extreme caution as damage may occur if cool and wet conditions occur after application.